Monday, 2:15pm CT— Good afternoon. After our break last night, rains have returned to the picture this morning and afternoon. Any rain adds insult to injury right now, but at least the rainfall rates have been, for the most part, under 1.50 inches per hour. This is small comfort obviously, but versus the rates we saw on Saturday night and Sunday, the word “manageable” keeps coming up. As manageable as something can be in this situation. As of 2 PM, radar is active, with steady moderate to locally heavy rainfall across the southern half of the Houston metro area. 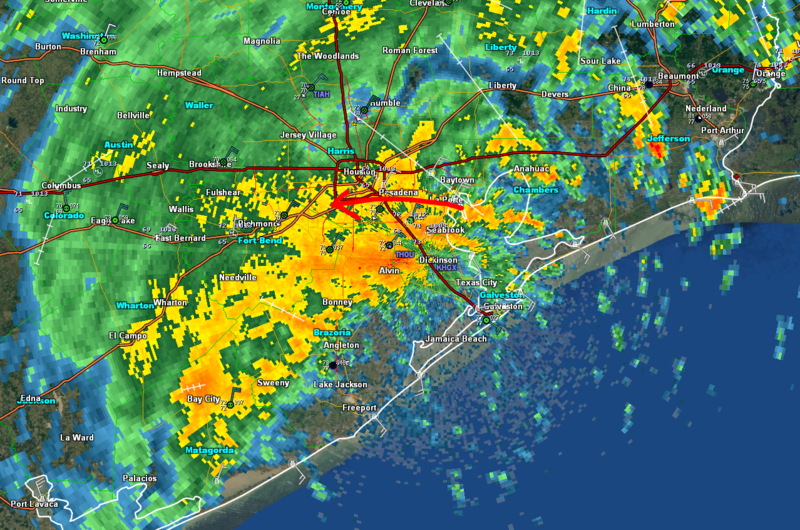 North of I-10 is seeing steady light to moderate rain persist as well. Rainfall rates as of 2 PM are about 0.25″ to 0.50″ per hour north of I-10 and 0.50″ to 1.50″ south of I-10. Again, insulting, infuriating, frustrating, but mostly manageable. It just really slows down drainage. Steady northeast winds inland and southeast winds at the coast are not helping matters either. There have been gusts to 40 or 45 mph, and that looks to continue, although significant increases beyond this are unlikely. What you see is what you get. Expect this rain to stay in place much of the afternoon. Rain may fall heavily at times, especially south of I-10. Winds will stay occasionally gusty. Wish we had better news on this front, but it’s going to be a pretty miserable Monday, and hopefully the rates stay at this manageable level. We feel they ought to. I don’t expect a lot of change tonight. Rain will likely fall steadily through the night, and into Tuesday morning. Harvey’s general east or southeast movement will pretty much lock things in. As Harvey begins to shift northward on Tuesday, we will start to see the rain become a little more sporadic I think. Steady moderate rain much of the time Tuesday morning into the afternoon. 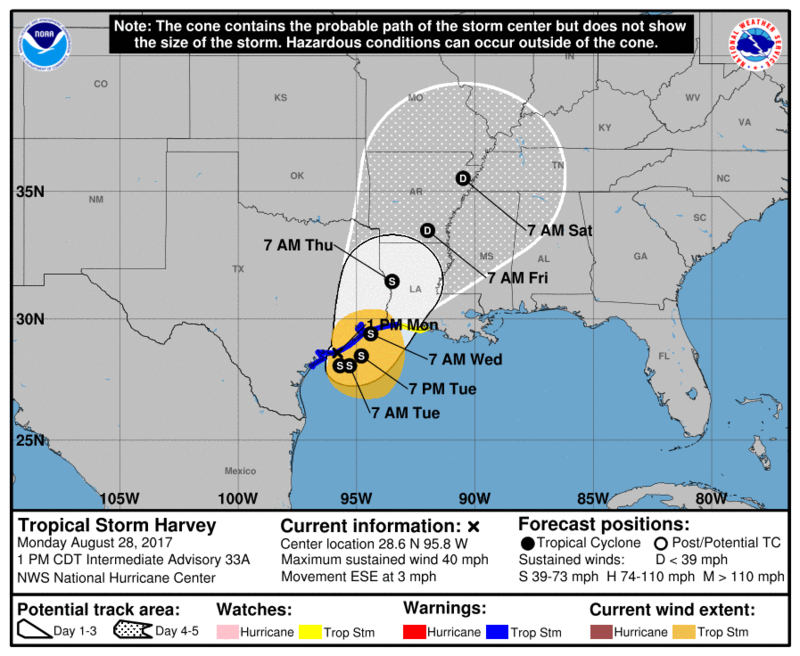 Harvey should make another landfall Wednesday near High Island, TX as a weak to moderate tropical storm (no significant strengthening is likely). This remains first and foremost a rain issue, and you should continue to monitor the water. Steady rain should end Wednesday and daily storm chances trend to close to zero by Thursday. We should see sunshine and much better weather to end the week, and we can begin our road to recovery. Stay safe all. Thank y’all for all your hard work. Appreciate the echoing sentiment of “manageable” rainfall. That’s the word I’ve been using for folks checking in. Watching the street drainage closely to gauge that, as well. It’s been steady since 8 am but not bathtub faucet torrential. Thank You for honest and accurate updates. They have helped me stay sane during these storm days. What about storm surge along Bolivar Peninsula with this second landfall? Glad to finally read some semi-decent news. 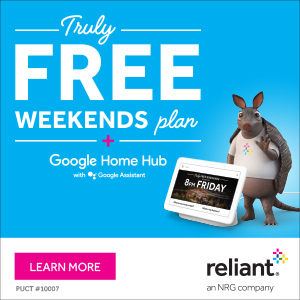 For the areas of west Houston (e.g. Katy, Fulshear, etc.) that haven’t had any significant flooding and are not in a the path of the reservoir releases, are we in the clear as far as the flooding of streets and homes is concerned? My neighborhood has been draining diligently (even in the torrential downpour we had for four hours last night) and there’s very little pile-up along the curbs now. Other than that, we’re dry and the bayou behind the neighborhood is at normal levels. Is it safe to say it’ll stay that way? Looking into the possibility of opening our home to some who may need it, but don’t want to be leading them somewhere just to evacuate again. Since Saturday, you have been one of my major sources of information. I’m relatively unaffected in Clear Lake but have needed your reliable weather updates, explained in plain English. Thank you. What were the average rainfall rates per hour on Saturday? Awesome stuff Eric!!! Thank you for the great well articulated put together forecast!!! How long do you think the flood waters will remain on major western roads after the rains conclude? Oops. I mean Matt!!!! Thank you Mattt!!!! Hi Matt and Eric. The news is covering reservoir activity and voluntary/mandatory evacuations heavily, and it seems that many people in Houston are still in significant danger even during this manageable stage. Can you describe a bit more how this plays into the forecast? Thank you so much for your updates. I have been reading every single post from over in Europe. My heart goes out to the people affected. Hopefully coming back later this week and can volunteer. Not a flood threat but this is only going to delay when we can get the freeways open and get this city running again. Could you please ask Harvey to leave the cool temps behind as he departs? I could get used to this. Kudos to you guys for the hype-free weather. I watch the on air guys/gals for entertainment but come here for the data. Matt / Eric, thank you both for keeping us informed on the weather. We have a flight Friday afternoon from IAH. What are the chances the airport will be functioning then? I have you same question! I have a flight out of IAH Friday night, trying to get to a friend’s wedding this weekend. Wondering if the airport will be operational, and if the roads to get there will be usable by then. Elsewhere I have read that Bush is not expecting to open until Thursday. I would stay in touch with your airline. Thank you guys so much for being so fantastic throughout this! I’m suspicious of the official rain gauges for Downtown. It’s been nonstop pouring since 10am by Minute Maid Park, but nearest official gauge shows only 1/4″ per hour. My cheapo gauge on the patio is showing 1/2-1″ per hour. I emptied it at 10am, and it shows 4.5″ at 3:30pm. Huge difference! Except for today, my numbers were give or take 10% with official. How deep do you think waters in the bays will get? at Lynchburg Ferry the level is over 7 1/4 feet now. https://tidesandcurrents.noaa.gov/stationhome.html?id=8770733. How high do you think it could get there before this is all over? I’m following Harvey from the Wisconsin as our son’s family is riding out the storm in Houston. I appreciate your honest, easy to understand information! THANK YOU! Praying for y’all! So you’re telling us we have a chance!!?! Hah, gotta make thru to tuesday night ! We can do this! We’re in the energy corridor area and pretty terrified at the possibility of Addicks and/or Barker failing. Is this a justified fear? How long after the rain dies down on Wednesday will it take for flood waters to recede and highways to be useable? Check https://drivetexas.org for the best information about road conditions on all state-maintained roadways in Texas—everything from Farm-to-Market roads to interstates. It’s thorough and as close as can be to real-time information.